This form is for the lease of a hotel formerly run by the landlord to a new operator tenant. The lease is a percentage rental lease, and all sales from the hotel operation, including room receipts and food and beverage receipts, among others, are included in the definition of gross sales. The lease also contains a variety of operating covenants for the tenant. This Lease is made as of _________________, by and between COMMERCIAL PROPERTY LANDLORD, INC., a __________________ corporation ("Landlord"), and AGREEABLE HOSPITALITY TENANT, INC., a _________________ corporation ("Tenant"). 1. Leased Premises. 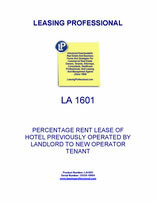 Landlord leases to Tenant and Tenant hires from Landlord the real property situated at __________________ consisting of a hotel commonly known as ________________ which property is more particularly des­cribed in Exhibit A hereto, together with all improvements now or hereafter constructed thereon all of which are here­inafter referred to as the “leased premises”. If the leased premises are now or hereafter served by an alley, easement or right of way, Tenant shall have full right of ingress and egress in common with others, over such alley, easement, or right of way. 2. Term. Tenant shall have and hold the leased premises for a term of ________ ( ___) years and ________________________ months commencing on the _____ day of _____________ , __ and expiring on the ____ day of ___________ , __. In the event the leased premises are ready for occupancy by Tenant before the commencement date of this lease, Tenant may, at its option, occupy the leased premises prior to such commence­ment date. Such prior occupancy shall be under all of the cov­enants, conditions and agreements of this lease, except such prior occupancy shall not require the payment of any rental. (a) Minimum Rent. Tenant agrees to pay to the place designated in the paragraph entitled or at such other place designated by Landlord in the provision below pertaining to "Notices" without offset, deduction, or prior demand therefor as minimum rent, the sum of ________ Dollars ($ _________) per annum payable in monthly installments of ______________ Dollars ($ _________) each in advance on the first day of the month. The minimum monthly rent shall be prorated on a per diem basis with respect to any fractional calendar month. Subject to the provisions of the paragraph entitled “Force Majeure,” the minimum rent shall commence on the first (1st) day of the month of the term hereof, or on the day Tenant is open for business at the leased premises, whichever first occurs. (i) Payment Quarterly. Tenant shall pay to Landlord for the leased premises as addi­tional rent, without demand, setoff or deduction, a sum (the “percentage rent”) equal to ______ percent (___%) of the gross sales (as hereinafter defined) of Tenant made from or upon the leased premises each calendar year, or portion thereof at the beginning or end of the term of this Lease, exceeds the minimum rent paid under Section 3 (a) above for such period. On or before the tenth (10th) day of each month, Tenant shall furnish Landlord with a statement in writing certified by Tenant, if Tenant is an individual or partnership, or by an authorized officer of Tenant if Tenant is a corporation, setting forth the gross sales for the preceding month (or portion thereof if at the beginning or end of the term of this Lease). On the tenth (10th) day of each January, April, July and October, Tenant shall pay to Landlord the amount by which the sun so computed as a percentage of gross sales during such preceding quarter exceeds the portion of the minimum rent which Tenant shall have paid during such quarter. (ii) Annual Adjustment. Within thirty (30) days after the close of each calendar year during the term of this Lease, Tenant shall furnish Landlord with a statement in writing signed and certified as correct by a certified public accountant and by Tenant, if Tenant is an individual or partnership, or by an authorized officer of Tenant if Tenant is a corporation, setting forth the gross sales for the preceding calendar year. If Tenant shall have paid Landlord an amount greater than Tenant is required to pay under this provision, Landlord shall credit such amount against the rent next coming due. If Tenant shall have paid an amount less than Tenant is required to pay under this provision, then Tenant shall pay the difference to Landlord concurrently with delivery of such annual statement. For purposes of computing the percentage rent, if the Commencement Date shall be a day other than January 1, the first calendar year shall be considered to be the period from the Commencement Date to the next succeeding December 31, and the last calendar year shall be considered to be from January 1 to the expiration or termination date. (iii) Records of Sales. Tenant shall keep at the leased premises or at Tenant’s prin­cipal place of business, full and accurate books of account, records and other pertinent data (including all supporting records such as original sales slips and checks, reports on excise and selling taxes and cash register tapes) of the gross sales relating to the leased premises (including the gross sales of any subtenant, licensee or concessionaire). Tenant shall, upon Landlord's request, furnish a copy, certified as true, of the sales tax reports, insofar as such reports pertain to the leased premises, filed by Tenant with the governmental authority charged with the collection of the sales or other tax covering any period of time for which Tenant has furnished a statement of gross sales to Landlord. Such books and records shall provide records of each day’s sales so that a day-by-day record is maintained, and shall be retained for a period of four years after the close of each calendar year. The acceptance by Landlord of any statement or any payment of percentage rent for any period shall not bind Landlord as to the correctness of the statement or the payment. At any time within two years after the receipt of any such statement, Landlord shall be entitled to conduct an audit of such gross sales either by Landlord or by a certified public accountant designated by Landlord. Such audit shall be limited to the determination of gross sales and shall be conducted during normal business hours. If such audit shall reveal a deficiency in the payment of percentage rent, Tenant shall immediately pay such deficiency with interest at the rate of ten percent (10%) per annum from the date when such deficiency should have been paid. In addition, if any of Tenant’s annual statements of gross sales shall be found to have understated gross sales by two percent (2%) or more, then Tenant shall pay all of Landlord’s costs and expenses connected with such audit. In the event that Tenant fails to submit any annual statement of gross sales when due, Landlord may so notify Tenant; if Tenant does not submit such statement within ten (10) days after delivery by Landlord of such notice, then Landlord may make an audit of Tenant’s books and records relating to the gross sales for the preceding year. Such audit shall be commenced within ninety (90) days after the date by which such statement should have been submitted. Any such audit shall be final and binding upon both parties. In the case of any audit made by Landlord as a result of Tenant’ s failure to submit an annual certified statement of gross sales when due, Tenant, within five (5) days after demand by Landlord, shall pay to Landlord the additional percentage rent that may be due, computed in accordance with the provisions of this Lease upon the basis of such audit, together with the expense of such audit. Any information gained from Tenant’s quarterly and annual statements or from an audit shall be confidential and shall not be disclosed other than to carry out the purposes hereof; provided, however, Landlord shall be permitted to divulge the contents of any such statements or audit in connection with any financing arrangements or assignments of Landlord’s interest in the leased premises or in connection with any administrative or judicial proceedings in which Landlord is required to divulge such information. (gg) Sales taxes, so-called luxury taxes, consumers excise taxes, gross receipts taxes and other similar taxes now or hereafter imposed upon the sale of merchandise or services, but only if collected separately from the selling price of merchandise or services. All sales originating at, in or from the leased premises, whether for cash or on credit, shall be considered as made and completed therein, even though bookkeeping and payment of the account may be made at another place and even though the actual delivery of merchandise or performance of a service may be made from or at a place other than the leased premises. 4. Costs of Management, Operation and Maintenance and Utilities. (a) The rental hereunder is net to Landlord throughout the term of this Lease. Landlord is not obligated to pay any costs of operation, maintenance or capital improvements. Tenant is to pay all Operating Expenses. The term "Operating Expenses" means all costs of management, operation, and maintenance of the leased premises as a hotel utilizing the ____________ hotel name or such other franchise as may be utilized by Tenant from time to time, including without limitation, the following: employment taxes, unemployment insurance, wages, salaries, fringe benefits, and other direct and indirect costs of employees; janitorial, cleaning, landscaping, guard, security and other services; gas; electrical, water, waste disposal, and other utilities; heating, ventilation and air conditioning; window washing; materials and supplies; painting, repairs, and other maintenance; parking lot resurfacing and restriping, as well as cleaning, sweeping, and ice and snow removal; maintenance, repair, replacement, and service of equipment, including without limitation the HVAC systems, alarm systems, and other equipment; reserves; costs of independent contractors; management fees and expenses; insurance and insurance deductibles of any kind; real and personal leased premises taxes, assessments; utility charges of any kind; the cost of any repair, renovation, alteration, and improvement required to be made under any governmental law, rule or regulation (excluding those in breach of any warranty of Landlord contained in this Lease); supplying directional signs, other markers, and car stops; and any other expense or charge which is a cost of management, operation, and maintenance of the leased premises. (b) Expense of License. The term Operating Expenses does not include any cost or fee for maintaining or terminating the ____________ franchise/license, which shall be the sole responsibility and expense of Landlord. (c) Utilities. Landlord, at its expense, shall have all utility lines, including but not limited to, electricity, gas, water and sewer, brought to a point within the leased premises. Tenant agrees to pay all charges for electricity, gas, water, sewer, refuse, telephone and other utility services used by Tenant on the leased premises during the term of this lease or any renewals or extensions thereof. 5. Use of Leased Premises; Environmental Matters. The leased premises shall be used for operation as a hotel, guest services, restaurant, retail and banquet/meeting facility and for no other purpose without the prior consent of Landlord. Tenant shall not allow use of the leased premises in a manner which would increase insurance premiums, or for any illegal purpose. Tenant shall comply with all governmental rules, orders, regulations, or requirements relating to the use and occupancy of the leased premises. Tenant shall not allow the presence, use, storage or disposal of any hazardous or toxic waste or materials on the leased premises at any time other than in full compliance with all applicable laws, rules, and regulations. Hazardous and/or toxic waste or materials shall include any substance, waste, or material which is designated as a Hazardous Substance under the Comprehensive Environmental Response, Compensation and Liability Act (42 USC Section 9601 et seq. ), the Model Toxics Control Act, revised Code of _____________ Section 70.105D), or under any other applicable law. Tenant agrees to defend, indemnify and hold Landlord harmless from and against any liabilities, obligations, damages, costs, and expenses (including attorneys' fees incurred prior to trial, at trial and upon appeal) incurred as a result of any hazardous or toxic waste or material having been used, stored, or disposed of on the leased premises or violations of applicable laws, rules and regulations relating to the use of the leased premises after the Commencement Date and during the term of this Lease. This indemnity shall survive termination of this Lease. Landlord warrants that, to the best of the knowledge of Landlord, the leased premises does not contain any hazardous or toxic waste or materials or asbestos containing material as those terms are defined above as of the commencement of the term of this Lease ("Existing Hazardous Substances") other than in full compliance with all applicable laws, rules, and regulations, except as disclosed in that Phase I Environmental Site Assessment dated _____________ prepared by __________ . Landlord represents and warrants that as of the date hereof (a) it has not received notification of any kind from any regulatory agency stating that the leased premises is or may be targeted for a federal or state Hazardous Substances cleanup or may be contaminated with any Existing Hazardous Substances, as that term is defined above, or is currently in violation of any applicable zoning, building, safety or accessibility law or regulation and (b) except as disclosed in the Phase I Environmental Site Assessment, Landlord has no knowledge of any release of any Existing Hazardous Substances or that the leased premises is currently in violation of any applicable zoning, building, safety or accessibility law or regulation. Landlord shall indemnify and hold Tenant harmless from and against any and all loss, damage, claims, penalties, liabilities, suits, costs, and expense (including without limitation, cost of remedial actions or cleanup), suffered or incurred by Tenant arising out of or related to the breach of the foregoing representations and warranties. (a) Equipment Leases, which shall mean the leases covering items of the type listed as Service Equipment which are not owned by Landlord but are leased by Landlord, and which are located in or upon the Premises and are used or useable in connection therewith. (b) Hotel Contracts, which shall mean all service, maintenance, and other contracts respecting the maintenance or operation of the hotel, which shall be transferred to Tenant to the extent transferable. (c) Improvements, which shall mean all buildings and improvements on the land described in Exhibit A. (d) Miscellaneous Assets, which shall mean the use of all contract rights, leases, concessions, permits, receipts, trademarks, logos, copyrights, business records, and any items of intangible personal leased premises relating to the ownership or operation of the hotel except for the mark "____________." Landlord shall provide to Tenant complete copies and, to the extent allowed by law, full benefit of any permits or other items which are not transferable. (e) Use of Names, which shall mean the names other than ____________ used in the operation of the hotel including without limitation the names now used with the restaurants, banquet rooms and meeting rooms in the Improvements, and specifically do include the mark "_____________" for hotel and restaurant use. Landlord represents and warrants to the best of its knowledge it has the sole right to use and transfer the Names and that it has no knowledge of any protest to its right to use the Names or of any right of any other party to use of the Names; however Landlord does not represent that it has protected or registered the use of the Names under any federal or state procedure. Landlord will cooperate with Tenant to accomplish transfer of any use rights to the Names. (f) Operating Equipment, which shall mean all china, glassware, linen, silverware and uniforms, and supplies of every kind and nature of all operating departments, including, without limitation, cleaning supplies, guest supplies, printing stationery, bar supplies, fuel, laundry supplies and brochures and promotional material whether in use, or held in stock for future use, in connection with the operation of the hotel, which are on hand on the date hereof, subject to such depletion and including such resupplies as shall occur and be made in the normal course of business. (g) Permits, which shall mean all licenses, franchises and permits used in the operation of the hotel as heretofore operated, which shall be transferred to Tenant to the extent transferable, but excluding the __________ license/franchise. (h) Service Equipment, which shall mean all fixtures, furnishings, fittings, equipment, machinery, apparatus, vehicles, appliances and articles of personal leased premises of every kind whatsoever used or usable in connection with any present or future operation of all or any part of the hotel, including without limitation all elevators, escalators, boilers, furnaces, heating, ventilating and air-conditioning systems and equipment, office furniture and equipment (including safes, cash registers and accounting, duplicating and communication equipment) and specialized hotel equipment (including equipment usable in the operation of kitchens, laundries, meeting and banquet rooms, clubs, rental spaces, dry-cleaning facilities, bars and cocktail lounges), electrical equipment (including refrigerators, radios, television and lighting equipment), fire prevention and extinguishing apparatus, telephone system, pictures and ornaments, which are on hand as of the date hereof, subject to such depletion and including such replacements as shall occur or be made in the normal course of business; excluding, however, all items of personal leased premises which are owned by Space Tenants or guests. (i) Space Leases, which shall mean all leases, subleases, licenses, franchises, concessions and other occupancy agreements, written or oral, whether or not of record, for use or occupancy of any portion of the leased premises, and "Space Tenants" shall mean the tenants or occupants thereunder. During the term of this Lease and thereafter in the event of purchase, Tenant assumes the obligations of Landlord under such Space Leases.